Bubur Sumsum or Indonesian Rice Flour Porridge is one among the popular desserts in Indonesia, especially in Java region. This sweet dessert always remind me back about my childhood time in my hometown, a small village in Kediri, East Java Province. Wherever there's a restaurant or small kiosk in the market or along the road which selling nasi pecel, the Rice Flour Porridge will be available on the menu list. I have no idea why they both are almost present in pairs. (Note :Nasi pecel is a Javanese rice dish served with cooked vegetables and peanut sauce). Perhaps because "Bubur Sumsum" is quite cheap but nutritious dessert. Or it is becauce its main ingredients is derived from rice flour, which's compatible with most Indonesian stomach including mine ;-) Since I was little and still living in Indonesia until nowdays as I'm living abroad, never once I get bored with this sweet dish. 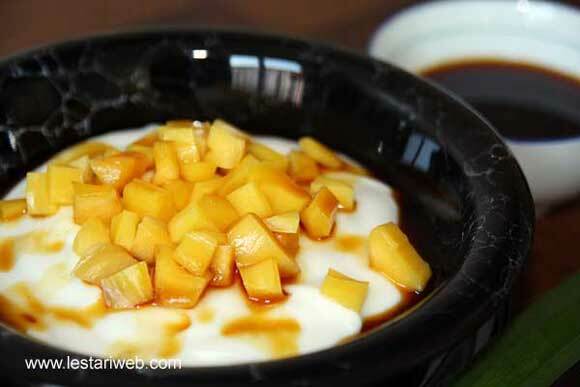 The combination between the salty porridge, sweet palm sugar sauce and pandan leaf's flavour is just perfect! Hopefully I could convince you to try it yourself :-). Why not? The ingredients are quite easy to find and the cooking process is also simple. Tips: There are many versions of cooking techniques in the making of Rice Flour Porridge, however I'd like to suggest you the conventional way that I've learnt from my mother to obtain the best result. It is adviced to filter the rice porridge batter through the kitchen sieve before adding it into the coconut milk. In this way you will get a solid but smooth porridge at the end. Mix the rice flour with 250 ml coconut milk and salt in a bowl then filter this mixture in a kitchen sieve. Put aside. 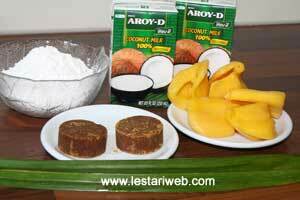 Put the other half of coconut milk and Pandan leaf in a sauce pan. Bring the coconut milk to boil, then adjust the stove over medium heat. Pour-in the rice flour batter into boiled coconut milk. Continue to cook and stiring all the time until the mixture become thick and begins to bubble. Remove from heat. Making Palm Sugar Sauce: Put all ingredients except Jackfruit in a saucepan. Simmer and stirring occationally until the sauce becomes thick. Add the Jackfruit and cook shortly for about 2 minutes. Remove from heat. Serving Method: Spoon the porridge onto the serving bowl and pour the sauce over it. YUM This I have to try first chance I get. My meat and potato eating husband is cautious whenever I serve vegetarian but he is fast becoming won over by the variety and flavor.